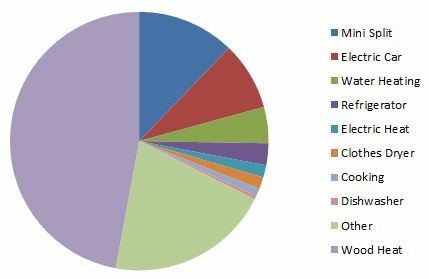 After one year we can see what our big energy users consume. This helps us make decisions about where we invest in energy saving improvements. The first thing to notice is that the total energy used (“Usage” in red) is almost exactly the same as the energy our solar system produced (“Generation” in green). That’s really just coincidence. Lately I’ve been doing energy modeling to help people size their solar system, and I can tell you it’s never that accurate. Plus, we didn’t even do an energy model to figure out how much solar we’d need; Nik and I just put as much PV on the roof as would fit. We even reconfigured the layout to fit one more row of panels up there. Nonetheless, it’s nice the numbers are so close because it means we’re still not paying anything to the utility, and they even owe us money because of the feed-in tariff. Next I look at the energy our mini-split heat pump used over the year. This is almost entirely heating, although I will admit to a few days of cooling last summer – but just a few! I tried to use the mini-split as much as possible because I didn’t want to have the big electricity surplus we had last year, and I wanted our wood to last the winter. 2.51 MWh (“megawatt hours”) is 2510 kWh (“kilowatt hours”) – a very small amount of energy for heating in this climate. However, you have to add in the electric resistance heat that we used in parts of the house that weren’t kept adequately warm by the heat pump: 313 kWh for “Heat in Master”, and perhaps another 100 kWh for plug in electric heaters that we didn’t keep track of. So, all told we used 2923 kWh for heat last year. Still very low, and still not accounting for the wood we burned. My best guess on the wood is we used up 3 cords, and making a lot of assumptions that equals about 9600 kWh. You can see that even if my numbers are off by 50% wood burning still represents the biggest piece of our energy pie. All in, heat is about 60% of our total energy used. Water heating energy is less than 1000 kWh – a good deal, but at the expense of a very cold basement. The refrigerator uses about 550 kWh: pretty good considering it’s probably ten years old. 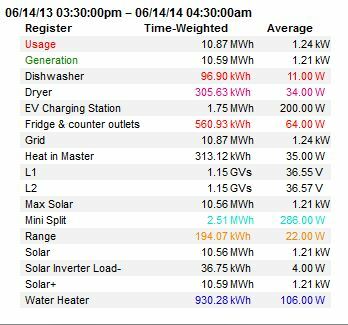 The dishwasher uses less than 100 kWh, a huge disappointment to me because I want to replace that old, brown dinosaur, but I certainly can’t do it on grounds of energy savings. Clothes drying represents only about half of our actual clothes drying because we use the clothesline for at least half the year. It’s gratifying to see all that work hanging clothes pays out in a pretty big way. Finally, the electric car… We haven’t had the car for a year yet, but just a few weeks shy. This summary shows 1750 kWh put into the car from our Level 2 charger, but for several reasons that’s not the actual annual total. I looked at data Nissan keeps online and the total we put into the car since we got it is 2209 kWh. When you add in the wood heat, this is our total household energy mix, including driving. lol re: you not being able to justify getting a new dishwasher. Save your pennies!